I worked summer jobs landscaping and mowing lawns to pay for the coming semester at college. The year in Japan had taught me a lot – and one of the things that it had taught me was that I didn’t want to me a missionary. The missionary that I’d been assigned to work with in Japan was so uncultured and racist that it had turned me off completely. I decided to do one more semester at the small Christian college I’d spent 2 years at before going to Japan, and then head to the opposite side of the country to a bigger university with more options when that was finished. But before starting the fall semester, I was interested to see what Karate training would be like at my home Karate club after having spent nearly a year training in Japan. I made a habit of arriving early to class so that I could work on the material that I’d learned from Kanao Sensei before the class started. Not long after I’d been back, while I was reviewing one of the Kata I’d learned in Japan, a senior member of the club approached me and asked me where I’d learned it. When I told him, he requested that I not tell or show anyone else in the club what I was doing. You see, I was still a brown belt, and apparently what I was working on was 3rd-degree black belt material in Canada. Woooo. Wouldn’t want to upset anyone with that now, would we? Wooooo. I rolled my eyes and agreed to keep it quiet. I practiced that material at home in the backyard from then on – along with the Kendo bokken kata that I’d learned from Fujiwara Sensei. Anyway, that semester passed pretty quick, and I was off to Vancouver, 5,000km away on the other side of the country. Although I’d been dumbfounded at the size of Tokyo (around 25 million), Vancouver was still pretty big by Canadian standards, at around one-tenth that size. Still pretty daunting for someone from a town of 3,600. I knew no-one in the city, and found myself in a youth hostel trying to find an apartment and a job before my money ran out. I had no idea what the city was like, and made a quick, desperate decision to rent a place that I went to look at one night. It was furnished. Pretty shoddily, but it was furnished. The first night I slept there I heard a huge crash right behind the wall of my room at about 4:30am. I discovered that my building was literally right next to the port and there was a freight rail line that ran right behind the building. Two train sections had bumped together to connect them, which is what had made the crashing sound. The next morning, I walked out into the sunshine and found myself dodging used condoms and needles on the sidewalk. Apparently Commercial and Hastings wasn’t the best place to be living. I found a job at a local Japanese tourist gift shop while waiting for the summer semester of the Canadian Summer Institute of Linguistics to start. It took me about 20 minutes to walk to work, and on the way I’d regularly be propositioned by drug dealers and prostitutes. After I’d been there a couple of months, a Vietnamese gang broke into a place up the street and killed 4 people to burgle their house. I decided I should probably look at finding a better place to live. Around that time, I read a newspaper article stating that women between age 20-25 who lived in the few-block radius I lived in were 25% more likely to die of homicide or drug overdose than anywhere else in Canada. I accelerated my new home search and found a place in New Westminster. I didn’t see a prostitute there for a full 2 weeks, so it seemed like a much better place to live. During this time, I was of course looking for a Bujinkan dojo to train in. I figured a city like Vancouver must have a Bujinkan training group, and I found what I was looking for – a seminar advertisement – at “Golden Arrow Martial Arts Supply.” I was ecstatic – finally a real, legitimate Bujinkan dojo. I called the number listed and made plans to attend the seminar, which was held at a school gymnasium in White Rock, just south of Vancouver. I got the bus out to White Rock and was happy to participate. There were a lot of differences from what I was used to. The group hadn’t been going that long, so most of the students were still fairly junior. I’d been doing martial arts quite seriously now for over seven years and had recently come back from a pretty full-on experience in Japan. But when I looked at the kind of things that were being shown, I was intrigued and could see that this would be a very interesting art once one developed a bit of skill at it. I began to train with the instructor in his regular classes, continuing my Karate training in parallel for the first few months. I had committed a number of years to Karate now, and didn’t want to put it aside lightly. 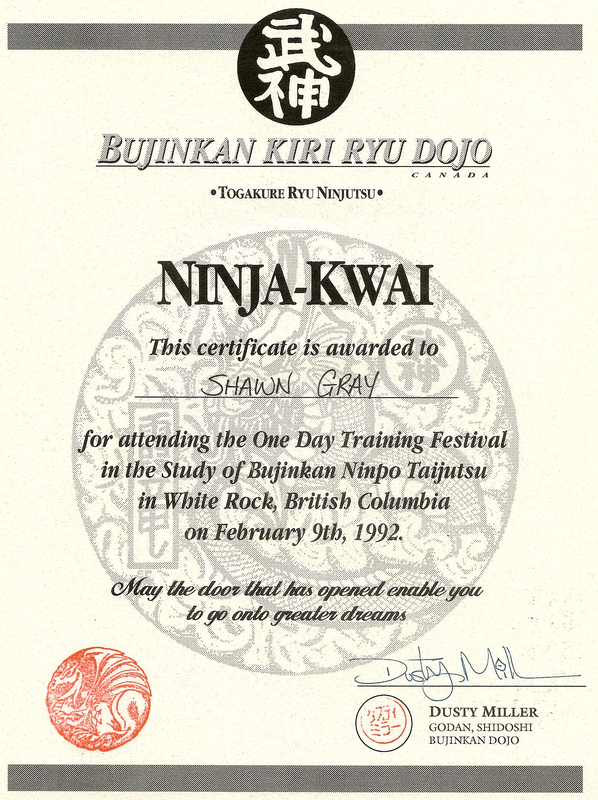 I was approaching my Nidan (2nd Dan) grading in Karate, which was a pretty big deal. Grades work differently in Karate than in the Bujinkan. The two top people in my Karate style in Canada were both Japanese gentlemen – one was 7-Dan and one was 6-Dan. These were considered very senior ranks in our style, so even a 2-Dan wasn’t anything to sneeze at. But I was becoming disenchanted with the Karate training. I found the local instructor in Vancouver to be unnecessarily stern and overly formal, much more so than the Japanese instructors I’d trained with in Japan. I was forbidden to cross-train in anything else, even though the Soke (grandmaster) in Japan had encouraged me to train in Judo and Kendo in parallel to my Karate training. The training itself was very much geared towards winning points in tournaments, and they were strict about the contact rules – that is, you could easily get disqualified for hitting too hard. Our instructor would pair us up and have one person hold a pencil upright between his thumb and index finger. You had to hit the pencil and whip your hand back without knocking the pencil over – that would indicate that the strike was too hard and would result in a tournament penalty. It really seemed like nonsense to me, and this made it a bit easier to make the final decision to put down my Karate black belt and step out of my white uniform, and step into a black Bujinkan uniform and put on a white Bujinkan belt. All the while I continued to dream of going back to Japan after completing my university studies. I was now enrolled at Trinity Western University (just outside Vancouver) working towards a BA degree in Intercultural Religious Studies with a Concentration in Linguistics. But most relevant to this particular story, perhaps, is that I was now training in a legitimate Bujinkan dojo that was connected to the Bujinkan headquarters in Japan. I found out that the Hombu Dojo in Japan was in a place called Noda – not Iga where I had gone looking for Hatsumi Sensei a year and a half before. The two places are actually about 500 kilometers apart. I had been way off. Next time I could get back to Japan, I’d be sure to be at the right place. Posted on March 11, 2013, in Bujinkan. Bookmark the permalink. 4 Comments. I really enjoyed your blog when will VI be out? D’oh I thought you went to Canada.